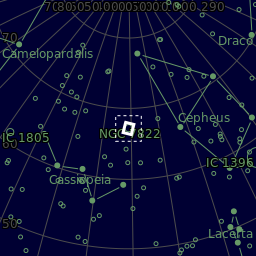 Sh2-171 (AKA NGC 7822) is a young star forming complex in the constellation of Cepheus, 2600-3200ly away from Earth. The nebula is included in the Sharpless catalog while the young star cluster located in the upper left corner close the dark nebula is cataloged as Berkeley 59. The star from this cluster pointed by the thin dark arrow with approximate position at 10 a clock, on the border of the dark lagoon, is BD+66 1673 is considered as one of the hottest stars within 1 kpc of the Sun. Its temperature is around 45 000 K and a luminosity ~100 000 times that of the Sun. It is one of the primary energy sources that lit the nebula and is forming the pillars of creation visible in the nebula. They are regions of star formation in which the proto stars create enough energy winds to resist to the powerful stellar winds of BD+66 1673.